Seen as its not long till the Olympics kick off, i thought i would post about the Olympic Torch as on Saturday it finally reaches British Shores! Below is a picture of the High Priestess in Greece lighting the torch, the same traditions for the Olympics are still used! 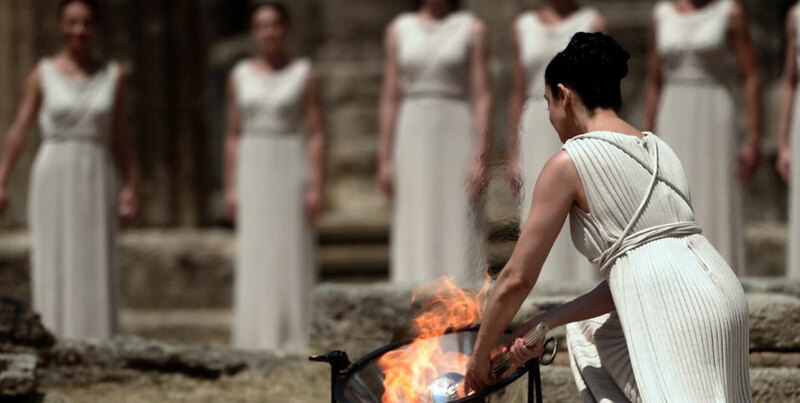 The lighting of the Olympic torch is a very sacred task and the origin goes all the way back to the days of the Ancient Greeks and even today the flame is still lit by a high priestess in Greece. The Flame commemorates the theft of fire from the Greek God Zeus by Prometheus, the fire was then kept burning throughout the Ancient Olympic games to honour Zeus. The Flame was reintroduced in 1928 Amsterdam Olympics and has been featured in the games ever since. Although the carrying of the Olympic Torch is a modern day not an Ancient theme of the Olympics it was introduced by Carl Diem at the Berlin Olympics in 1936 which were organised by the Nazis! The torch is lit a few months before the games at the original site of the Ancient Olympic Games at Mount Olympia in Greece. Eleven women which represent the Vestal Virgins perform a ceremony in which the Torch is lit by the light of the sun and a mirror. The Olympic Torch Relay ends on the day of the opening ceremony in the stadium of the Games. The final carrier is often kept unannounced until the last moment, and is usually a sports celebrity of the host country. The final bearer of the torch runs towards the cauldron, often placed at the top of a grand staircase, and then uses the torch to start the flame in the stadium. It is considered a great honor to be asked to light the Olympic Flame. After being lit, the flame continues to burn throughout the Olympics, and is extinguished on the day of the closing ceremony. Exciting stuff mixed with both modern and ancient history! !